Battle Fantasia comes to Steam in a revised edition. Find out what and how much was revised in our review below. Arc System Works has built up quite a name for itself when it comes to quality 2D/2.5D fighters. Over the past 15 years or so, the Guilty Gear and BlazBlue series have been greeted with almost universal critical acclaim and a growing following of fans. 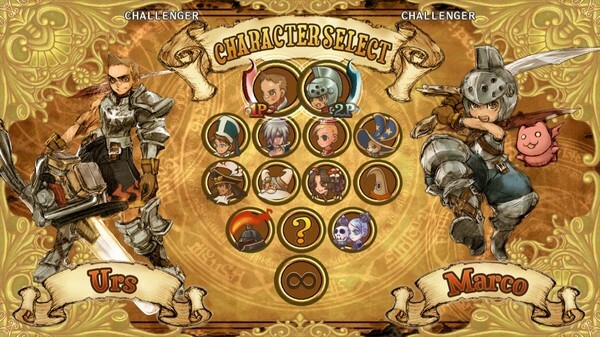 Battle Fantasia is a much lesser-known title from the Arc System Works stables, and was originally released in arcades back in 2007 with console versions 2008 and 2009, depending on where you live. Since then, the arcade version has received several updates – many of which relate to balance changes. It’s important to point this out, because one of the main points of criticism towards the original console releases was the matter of unbalanced fights. Stringing together ground combat, aerial combat and long distance combat was easy and fluid, but would often result in unbreakable combos that took the fun out of the game due to unevenly matched battles. The newly released “revised edition” brings all these changes to PC owners looking for their 2D fighting fix through Steam. The balance changes are the most important change to the revised edition, although support for higher resolutions was also added – as were a few new camera angles that only show up when executing special moves. The camera angles don’t add much to the experience, but the bump in resolution and graphics quality is a welcome change. The usual high quality of Arc System Works’ animation work is also present in Battle Fantasia, but you still have to consider that the original game is close to 10 years old now. What’s new aside from the aforementioned layers of polish? Not that much – the package is a rather formulaic 2D fighter with all the usual game modes, ranging from arcade to story and from time attack to survival. The roster is limited to 12 characters, but all of them are wonderfully well designed – from the visual quality and the animations right down to the fact that no two characters are alike. No Ken and Ryu here, so to speak. It’s a big compliment to the designer, although possible also the source for the initial imbalance that many perceived. Which brings us back to the start – the balance changes. While our experience with the original game is limited, we never perceived any serious imbalance that couldn’t be attributed to our own lack of skill and experience. In that sense, the revised edition of Battle Fantasia is a definite success. It’s still a 2007 game that doesn’t live up to the likes of Street Fighter IV or the more recent BlazBlue games, but it’s the definitive version and worth picking up for fans of the Arc System Works portfolio. It’s priced as a budget release as well, so if you’re in that category of gamers and missed the console releases – here’s your chance!